Friend of Quiet Babylon, Quinn Norton was in New York when the police evicted Occupy Wall Street from from Zuccotti park. In an effort to give her some protection from the baton and pepper spray happy NYPD, Wired tried to get her press credentials. It didn’t go well. Wired has been trying to get NYPD press credentials for freelancer Quinn Norton, who is on special assignment to cover the Occupy movement. Even before this week’s arrests, the NYPD made it clear they would not issue her credentials, as she first had to comply with Kafka-esque rules, such as proving she’d already covered six on-the-spot events in New York City — events that you would actually need a press pass to cover. 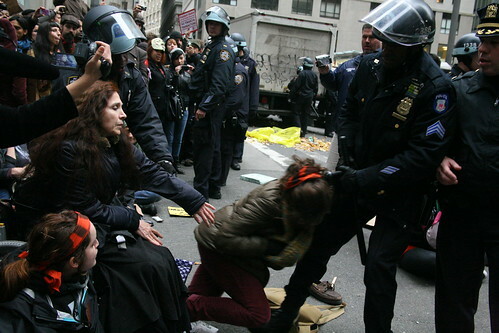 Josh Stearns is tracking the arrest of journalists covering the Occupy sites and evictions on Storify. So far, he’s counted 26. Stearns’ post is a simple recitation of facts, so it largely side-steps the ontological problem of what and who constitutes a journalist. In this video, a RoboKopter flies over the Warsaw riots. A drone journalist! Andy Baio made a video of the UC Davis pepper-spray incident that consists of 4 other videos synched. I was stunned and appalled by the UC Davis Police spraying protestors, but struck by how many brave, curious people recorded the events. I took the four clearest videos and synchronized them. Erika Fry attempts to tackle the ontological journalist problem head-on but gets side-tracked. After briefly mentioning the main issue, she treats it primarily as a procedural problem. Why did this happen? Part of the answer is simply a byproduct of the everyone’s-a-journalist rhetoric that defines our media these days. The more proximate answer, though, has to do with how the NYPD has decided to determine who is a journalist. Simply put, without a press credential issued by the NYPD’s Office of the Deputy Commissioner for Public Information (DCPI), you are not a journalist in the eyes of the police. Note the assumptions of journalistic privilege. Journalists ought to have special access and special protection. Journalists (whatever those are) are being credentialed by the wrong people. 26 journalists were arrested. All those other people who were arrested with cameras and recording gear? Not journalists. 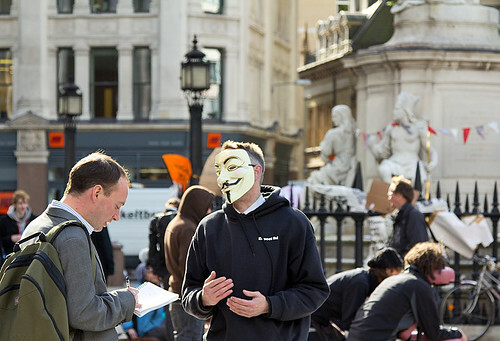 The various Occupy media teams, many of whom were arrested? Not journalists. Compare this response to the American Library Association’s unequivocal press release about the destruction of Occupy Wall Street’s ad hoc People’s Library. The very existence of the People’s Library demonstrates that libraries are an organic part of all communities. Libraries serve the needs of community members and preserve the record of community history. In the case of the People’s Library, this included irreplaceable records and material related to the occupation movement and the temporary community that it represented. We support the librarians and volunteers of the Library Working Group as they re-establish the People’s Library. Matthew Ingram doesn’t see rhetoric about everyone being a journalist, he sees a new reality. He’s feeling pretty optimistic about it. So what does the world look like when journalism is everywhere? We are beginning to find out. And while it may be a frightening prospect if you are a traditional media company, there is a lot to be optimistic about if you are just interested in the news. A world where everyone is a journalist may be a bit more chaotic and a bit more complicated than the one we are used to, but it will also be a bit more free, and that is clearly a good thing. Alexis Madrigal traces the linage of the police tactics that lead to events like the eviction from Zuccotti and everywhere else. As Vitale would put it, the theory “created a kind of moral imperative for the police to restore middle class values to the city’s public spaces.” When applied to protesters, the strategy has meant that any break with the NYPD’s behavioral preferences could be grounds for swift arrest and/or physical violence. Ingram’s optimistic take downplays the terrible consequences of everyone being a journalist. It’s not simply “a bit more complicated”. The endpoint is terrifying. I wrote about this after the G20 protests hit Toronto. This is the terrifying endpoint that [Ingram] does not reach. When everyone is a journalist, not only do their fates no longer warrant special attention by the people being covered, their fates no longer warrant special attention by the people consuming their work. When everyone is a journalist, no one gets special protection. When riot gear is an appropriate tool to ensure a quiet street, everyone is eligible for batons and pepper spray. Andy Baio chose the four clearest UC Davis videos. There were hundreds more. If the panoptiswarm has a lot of eyes and ears, it also has a lot of mouths. Regular people are identifying this new approach’s salient features as well. The large-scale deployment of video recording technologies combined with high-speed media diffusion channels have allowed everyone to see what only a tiny number did back in 2003 in Miami. They are seeing kids getting pepper sprayed and hundreds of protesters getting arrested. They’re watching police throw flash grenades into groups of American citizens. These images are coming to them through the same Twitter accounts and Facebook updates that show them photos of their friends’ new babies and the score of the USC game. Jess Zimmerman reminds us that after the Kent State shootings, 58% of Americans polled blamed the students for the deaths. Will the new vector of information change their attitudes towards these protestors as they endure physical coercion? If everyone is truly a journalist, then it’s time journalists started rewriting headlines to reflect that fact.